A tough test awaits Jimmy “The Silencer” Yabo in his first outing under the ONE Championship banner in 2017, but the Filipino fighter believes that he will be the roadblock to his highly-touted Brazilian opponent’s impressive run in the organization. After ten months sitting on the sidelines, Yabo makes his return to the ONE Championship cage to take on Brazilian grappling ace Bruno Pucci on the undercard of ONE: LIGHT OF A NATION, which takes place at the Thuwunna Indoor Stadium in Yangon, Myanmar on Friday, 30 June. Yabo, who has been competing in the sport of mixed martial arts (MMA) for nearly a decade, stressed that his experience will play a pivotal role in trumping Pucci in their five-round featherweight encounter. 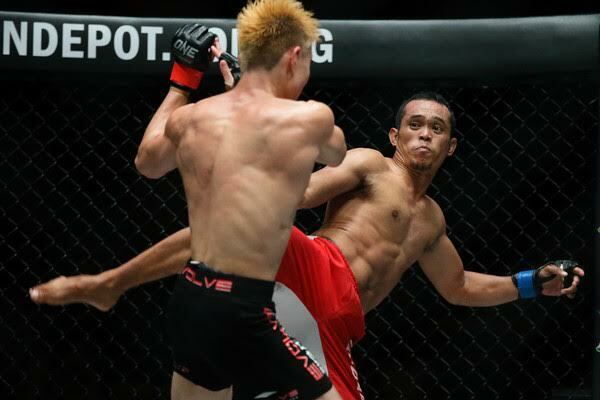 Holding a professional MMA record of 5-4, 1 NC, Yabo boasts one of the best finishing percentages in ONE Championship’s featherweight division as his last five wins came by way of knockout. Yabo’s most impressive victory was when he knocked out Pakistan’s Bashir Ahmad in 21 second with a counter right hook in February 2016. However, Yabo has a tall order in front of him as Pucci is considered one of the most promising young talents to represent Brazil on the international stage of MMA like ONE Championship. A first-degree Brazilian Jiu-Jitsu black belt and world champion in No Gi, Pucci owns a win-loss slate of 4-2 and is famous for finishing all his fights on the ground via rear naked choke. Although Yabo is entering the featherweight contest as the experienced competitor, being complacent is one trait that he wants to avoid as he faces Pucci on 30 June. “I shouldn’t be overconfident in this fight. He may be a young fighter, but he presents a stiff test. I have to be careful,” he stated. Despite the ten-month layoff and the two-fight losing skid, Yabo is confident that he can get the job done against a tough opposition like Pucci. “I am very confident that I can win this one. I learned my lesson from defeats. It’s time for me to rise up and make a statement,” he asserted. “Experience is the key. Bruno Pucci is young and talented, but I have been around for so long. I am ready for this given task to fight him,” Yabo ended.